Aaaahhh!!! the new year! The perfect opportunity to reflect on things that are working in your life and things that aren't. For me, it's a time of retrospection when i re-write my new year resolution (as i always do) which includes my food and healthy lifestyle goals. Hopefully, i'd summon the will power to stick to them all this time...there's no harm in trying innit? 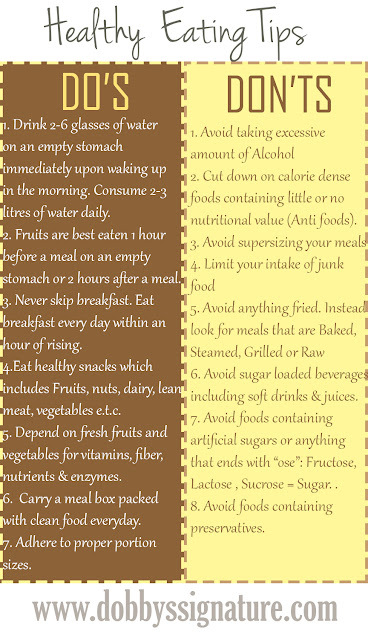 :D. So, what better way to jump start the year than with an inspirational healthy eating post i put together. Here are some useful tips to keep in mind. 1. Drink 2-3 glasses of water on an empty stomach immediately upon waking up in the morning. Drink 2-3 liters of water daily. 2. Fruits are best eaten 1 hr before a meal on an empty stomach or 2 hrs after a meal. 3. Never skip breakfast. Eat breakfast everyday within an hour of rising. 4. Eat healthy snacks which includes fruits, nuts, dairy, lean meat, vegetables e.t.c. 5. Depend on fresh fruits and vegetables for Vitamins, fiber nutrients and enzymes. 6. Carry a meal box packed with clean food everyday. 7. Adhere to proper portion sizes. 1. Avoid taking excessive amount of alcohol. 2. Cut down on calorie dense foods containing little or no nutritional value. 3. Avoid supersizing your meals. 4. Limit your intake of junk food. 5. Avoid anything fried. Instead, look for meals that are Baked, steamed, grilled or raw. 7. Avoid foods containing artificial sugars or anything that ends with 'ose': Fructose + Lactose + Sucrose = Sugar. 8. Avoid foods containing preservatives. Thanks for the tips Dobby - Happy New Year! Glad to have you here Glorious child. Well done Dobby.. I'd try, eish it's always difficult. Yes Dobby, it is also important to consume water (clean water) regularly, inorder to avoid dehydration. How do u avoid frying plantain? Can it be grilled?